Bishop Kearney H.S., Bensonhurst, held its annual “You Make a Difference Day” May 4. The event commemorated the dedication that teachers put into their jobs. Bryonna Valero, class of 2021, gave an award to Ms. Corso. “She’s not only my teacher, she’s family,” said Valero. 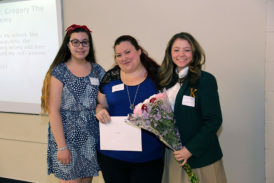 Alessandra Latino, Ms. Michelle Spinella, St. Peter Catholic Academy, and Italia Acevedo. All the teachers who were chosen had influenced their students in a memorable way. Current freshmen who attended were filled with nerves and the need to make their past teachers proud. The freshmen and eighth grade students found common ground in their love for Bishop Kearney. They all said their teachers had inspired them. Italia Acevedo, class of 2020, said her teacher, Ms. Spinella, inspired her to achieve her goals. The event was created by Sister Virginia more than ten years ago. She started this to give thanks to honorable staff members. Sister Virginia mentioned one particular teacher who attended “You Make a Difference Day” when it first began. The teacher had been in her position for more than 30 years and had never once been thanked by a student before the award ceremony. Barbara Kay­­ is a freshman at Bishop Kearney H.S., Bensonhurst. She interviewed her classmates and teachers as part of the first installment of The Tablet Youth Page’s new column entitled ‘Around the School Bell’. The column is open to any student attending a diocesan high school who wants to share the latest school events through their own eyes and words. If you’re interested in writing for ‘Around the School Bell’, contact youth editor menaje@desalesmedia.org.